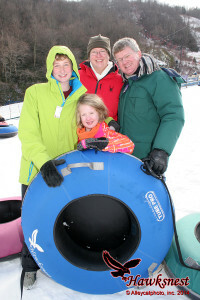 Our family just got back from our annual tubing/skiing trip. Despite Jessie having a stomach bug on the drive up, and Ben and I fighting colds, we continue to be blessed year after year with good weather, and the trip turned out to be fabulous. Jessie can definitely say that she knows how to ski now; she is so good that even tagged along with her big brother several times down a chair-lift run. Ben steps up his skiing, too, with multiple trips down an intermediate slope. Alas, it’s too late for them to qualify for Sochi, but there’s still hope for 2018.